Q Exactive Focus mass spectrometry with DART (Direct Analysis in Real Time) produces mass spectra in real time, directly under ambient conditions without sample treatment, without solvent extraction or other sample preparation, even directly on surfaces as paper, glass, TLC plates. DART is a non-contact sampling method. In contrary to traditional solvent sample introduction, almost no memory effect between different samples occurs. DART offers convenience of sample analysis and overcomes restrictions in speed, as experienced in mass spectrometry analysis with traditional available ion sources. When using DART coupled to a high resolution MS (HRMS) such as the Q-Exactive-Focus, time consuming separation techniques as HPLC are not required. The DART is also able to analyse less polar compounds with the traditional ESI source, but within a lower mass range. The default mass range is below m/z 1200 (due to the heating with the DART), but higher masses of thermal stable compounds can be analyzed. In contrast to DART, other mass spectrometry analysis methods with high vacuum system require time consuming sample preparation. Then the dissolved samples may result in carry over between samples. Furthermore, solid samples can analysed with a direct insertion probe with according drawbacks. 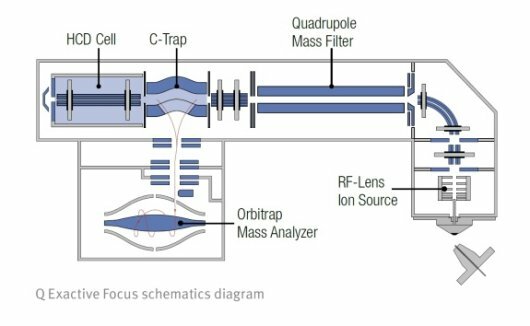 The Q-Exactive Focus mass spectrometer DART combines quadrupole precursor selection with high-resolution, accurate-mass detection, with a sensitivity that rivals triple quadrupole mass spectrometers and a resolution that surpasses Q-TOF instruments. Installed with a DART probe is a new ionization device for rapid, non-contact surface sampling of compounds. Exited-state species of helium interact with reagent molecules and sample present. Analysis of the sample at ambient pressure in open air. It’s possible to do analysis direct on samples without sample pre-treatment. DART coupled to high resolution MS can be applied to a broad range of applications in the fields of pharmaceutical and biological research, forensic science, food safety, drug screening, threat detection and characterization of self-assembled monolayers. Food quality and safety: detecting food contaminants and biotoxins in food. Drug screening: fast identification of active ingredients in tableted drugs. Self-assembled monolayers: obtaining structural information of the monolayer on surface of choice. Biological research: analyses of plant material such as root and leaves of treated or infected plant materials. The DART is applicable on other MS systems with other specs, for example the Ambient Mass Spectrometry Imaging system (ambient MSI). (Un)targeted scanning of locks of hair for drugs of abuse by direct analysis in real time-high-resolution mass spectrometry Duvivier, W.F. , Rutten, Marc van , Beek, T.A. van , Nielen, M.W.F. (2016) Analytical Chemistry 88 (2016)4. - ISSN 0003-2700 - p. 2489 - 2496. Use of Ambient Ionization High-Resolution Mass Spectrometry for the Kinetic Analysis of Organic Surface Reactions Sen, Rickdeb , Escorihuela, Jorge , Smulders, Maarten M.J. , Zuilhof, Han (2016) Langmuir 32 (2016)14. - ISSN 0743-7463 - p. 3412 - 3419.